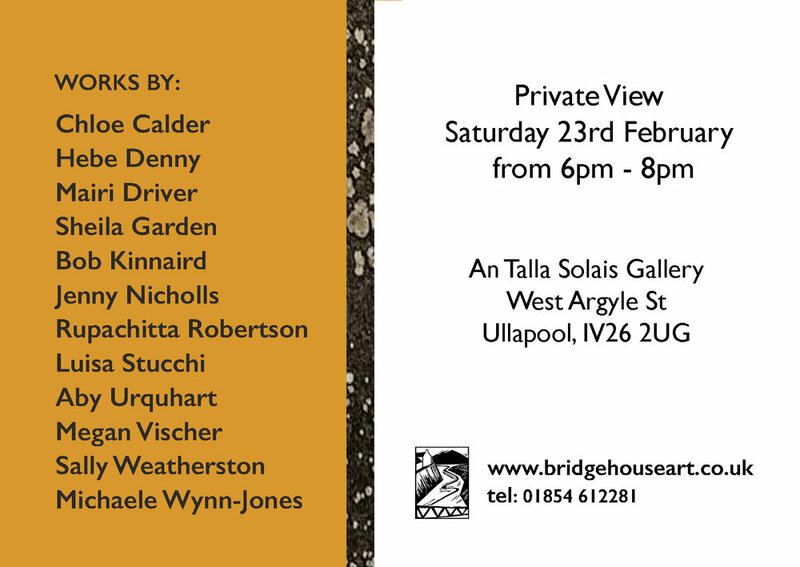 After a winter break, An Talla Solais Gallery is opening its doors again for the annual, end-of-course exhibition from students on the Bridge House Art Portfolio Course. One of the smallest and most highly respected independent art schools in Scotland, Bridge House Art is a valuable educational resource for the Highlands with a growing international reputation, hosting students from as far afield as Lithuania, France, Switzerland, Spain and the USA. Coming from a range of ages and backgrounds, all the students have one thing in common - a shared desire to develop as artists. The sixteen week course covers a range of disciplines including painting, printmaking, textiles and sculpture. Each individual spends the second term developing a body of work from their chosen theme and these will be on show at the exhibition, which promises to be an eclectic mix of drawing, painting, printmaking, jewellery and illustration. Much of the work will be available for sale. Eleanor White, Founder and Principal tutor said ‘The ethos behind all of our courses is to encourage everybody to learn to communicate visually and express a genuine response to the environment around us. I have been delighted with the way this year's students have responded to the challenge, this promises to be an excellent exhibition’. Kittie Jones, Senior tutor and award-winning professional artist said: ‘I am always impressed by the dedication, hard work and motivation of the students on this course, many of them have moved up here to be part of the course and the results speak for themselves. I am sure many will go on to develop diverse creative practices and I look forward to following their progress from here’. Class of 2019 (L to R): Sheila Garden, Bob Kinnaird, Rupachitta Robertson, Sally Weatherston, Kittie Jones, Luisa Stucchi, Aby Urquhart, Jenny Nicholls, Mairi Driver, Megan Vischer, Hebe Denny, Chloe Calder, Michaele Wynn-Jones, Eleanor White. Bridge House Art (www.bridgehouseart.co.uk), based in Ullapool is a non-residential school offering a summer programme of weekly courses, weekend and evening courses as well as the four-month Portfolio Course in the winter. The Portfolio Course is unique to the west coast of Scotland and offers students an opportunity to study in an intimate and stimulating environment. It is designed for people who wish to gain access to degree study at art school or would like to study art at a deeper level. Many mature students have used this course as a sabbatical or as a chance to develop a new direction in their lives. The course offers excellent studio facilities for twelve students ensuring a personal input in a creative and supporting environment.